(Be Free) MUVE dancing games are easy and adaptable for everyone. This game is called, "Follow the 3 Muses in the Center "- this is the 1st game of the Triangle Game series. 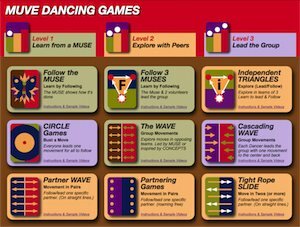 This video demonstrates one of our beginner games- utilized as a creative physical warm up for any group.. People learn to "MUVE" by following the lead dancer called "The MUSE." The MUSE will spontaneously create movements for you to follow "loosely" as we say. It means that you are not expected to precisely copy what you see, but to use the movement ideas as an inspiration to create your moves just the way you like them. At any moment you are encouraged to explore on your own, or to just follow along like a bird in a flock. The MUSE will keep her moves simple so you can catch on. She will demonstrate movements with different body-parts or movement types, speed, emotion - all to get you to experience brand new ways of dancing. (Bare Necessities) Seems like preschool and kindergarten students are always excited to dance, so getting them up and moving shouldn't be hard to do. These kids are experiencing MUVE for the very first time. Some jump right in while others need some time to adjust to the situation. Here you see a preschool dance party with four groups with a total of about 80 kids. For inspiration we are displaying the MUVE Bodyparts concepts cards. The dance leader (The Muse) demonstrates movements for the different bodyparts. The kids pick up the idea or create their own - as always in MUVE. (Brand New Day) In MUVE we inspire each other with dance moves. This video shows Muse Maggie start her session at her after school program with a dance-along inspired by the MOTIONS Concepts. Muse Maggie and her 2 helpers in the Center Triangle create improvised moves exploring the Concepts. The group of elementary school kids follows loosely. In MUVE any move is okay. Children can follow or make up their own dance moves. (Black or White) Watch these students have fun with MUVE's dance games for kids. This dancing activity is all about catching the beat of the song and dancing harmoniously with the rhythm. In this MUVE dance lesson, MUVE Educators support young Muses as they enter the center triangle and inspire the whole group with their dance moves, transitioning between 1,2,4,8 count emphasis of the song. MUVE supports fun fitness exercise for kids can enjoy together, while simultaneously showing how to dance for kids. (Cosita Rica) People learn to "MUVE" by following the lead dancer called "The MUSE." The MUSE will spontaneously create movements for you to follow "loosely" as we say. It means that you are not expected to precisely copy what you see, but to use the movement ideas as an inspiration to create your moves just the way you like them. At any moment you are encouraged to explore on your own, or to just follow along like a bird in a flock. The MUSE will keep her moves simple so you can catch on. She will demonstrate movements with different body-parts or movement types, speed, emotion - all to get you to experience brand new ways of dancing. (The Party's Just Begun) This exercise activity for kids is an easy dance along workout that anyone can do with their group. In this game 3 Muses alternate leading the whole group and all players follow the Muse in the center. In every group there are individuals who love to share their MUVES and don't mind being the center of attention throughout the whole song. Select 3 Muses to lead the dance and determine the method for the Rotation Calls. Explain that whenever the Center Triangle rotates, so do all Triangles. This keeps everyone activated and connected to each other.